Canada Day is always a spectacular and impressive display of our pride for our Canadian heritage. This year, with 150 years of history, culture, arts, and more, the celebration will be larger than ever. Join in on the festivities, and celebrate Canada’s 150th Birthday at home with some of these creative ideas. With Canada’s birthday celebrations landing in July, the weather is hot, and the sun is out. Keep your friends and family cool by throwing a backyard pool party! Regardless of whether you have an in ground pool or just a few above ground wading pools, keeping cool on July 1st is a fun and unique way to celebrate. Decorate the backyard using red and white balloons, Canadian flags and red and white lanterns.To create a balloon arch, follow this step by step tutorial. Fill the pool with red and white inflatables and enjoy an afternoon of partying and keeping cool. Enjoy the Canadian summer and host a backyard Barbecue party. Invite your friends and family over by sending themed invitations from HubPages.com or create your own design. Decorate the backyard using a red and white theme, and serve red and white side dishes with your burgers and sausages. For recipe inspiration, Chatelaine Magazine has a list of Canadian recipes perfect for a backyard BBQ. Test your friends’ and family’s Canadian knowledge and organize a mini “Amazing Race Canada” in your backyard. Include your neighbours and collaborate so the challenges can be at different locations. Life of Bliss has some ideas for challenges and you can use your imagination to give them a Canadian theme. 1. Start with your movie screen: Depending on the number of people you are inviting to your celebration, your screen size may vary. 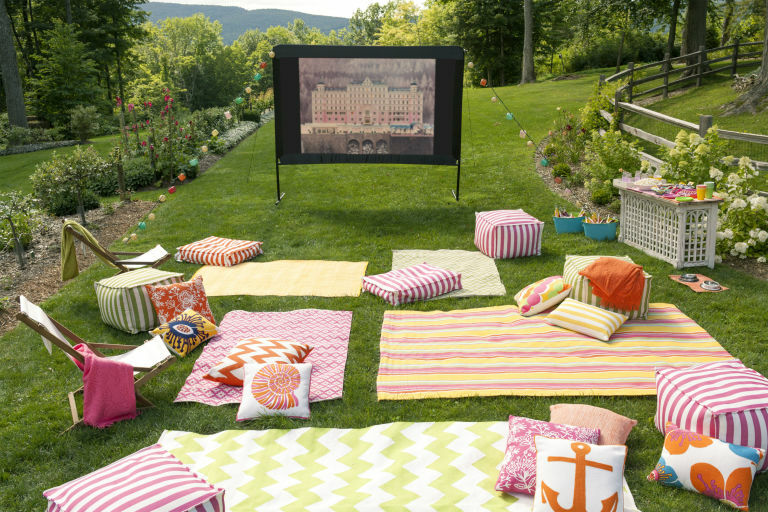 Follow this easy step by step tutorial on creating a portable outdoor screen. 2. Determine how to show the movie: If you have a projector of your own, this step is simple, however, if you do not, you may have to borrow or rent one. Some libraries allow rentals, and there are some independent companies that allow daily rentals at a rate of 40-50 dollars per day. If your budget does not allow a rental cost, consider creating a homemade projector like this one. 3. Choose your seating: The type of seating you use can vary, depending on the age of your audience. Blankets and pillows are a cozy way to enjoy a movie with friends and younger children or you can use camping chairs for your older guests. 4. Set up a snack bar: No movie is complete without popcorn! Set up a snack bar where your guests can serve themselves. For Canadian inspired snacks, The Food Network has a list of 40 recipes for red and white desserts to serve. For easy clean up and to add more colour to the party, use red and white paper plates and cups. 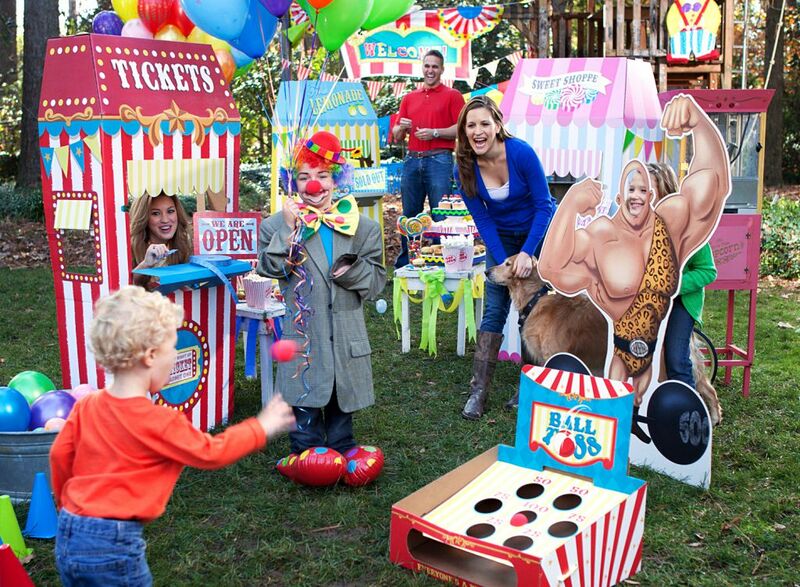 With vibrant colours, flashing lights, and games, carnivals are a fun and exciting experience for people of all ages. This year, to celebrate Canada’s 150th birthday, gather your friends and family, and host a backyard carnival. Planning a mini carnival is easy if you use ideas from Pinterest like homemade games, snacks to serve, and decorations to use. To end the event with a special added touch, strategically place decorative lighting throughout the backyard like these hula hoop chandeliers and have an end-of-the-night light show. Distribute sparklers to everyone and celebrate Canada’s 150th in the magical glow. Ultimately, celebrating Canada’s 150th is easy and can be fun for everyone, without even leaving your home. So enjoy the festivities on July 1st and plan an event that your friends and family will remember. For more ideas on celebrating Canada’s 150th birthday, visit the Falconcrest Homes’ Blog. Celebrate Dad this year by taking him into the great outdoors to enjoy family, sunshine, and good food. June 18th is National Picnic Day, as well as Father’s Day, so it is a perfect opportunity to participate in both occasions at the same time! Here are some of our favourite places to throw a Father’s Day picnic in Vaughan. Purchasing a new home is a pivotal moment in your life and it opens up new opportunities for you and your family. Before moving in, consider the importance of financial plans, and how to handle any debts associated with purchasing a new home. Here is some financial advice for new homeowners.